Social media marketing in an incredibly powerful business tool, but only if you remember why it works. It is all about the fans. People follow your business, tweet, click, like, post, share or comment because they are fans. It is not about the technology, or the platform. The popular channels can change with the whimsy of the customer marketplace. Yet, the connection to your fan-base can live on. It is all about the fans. Social media marketing is all about the fans. Why does it work? 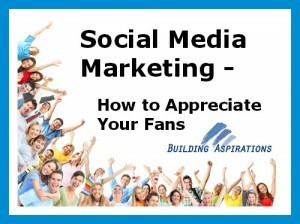 Marketing on social media works because your fans love you. The precise name of your fan might be a connection, a follower, a subscriber or friend, but they all are really fans. Fans connect with you. They love something about you, your business, or your product, and this emotional attachment is a responsibility for you. You need to appreciate your fandom and continue to respect them with the service, quality or other traits that attracted them in the first place. This builds loyalty. One simply needs to watch the news on the night before a release of a iPhone to understand the power of the loyal and dedicated fan. For example, the tv news stations are flooded with interviews of people sleeping outside in front of Apple stores to be the very first person to buy the next version of a phone they already have. These are fans. You have fans too. The weekly readers of your blog, the retweeters on Twitter and the people who constantly and consistently post on Facebook are all fans. There are strong emotions involved in a fan relationship, and they cannot often be easily analyzed via columns in a spreadsheet but, whether it can be easily explained or not, they spend money, and sometimes a lot of it. A true fan is not a bargain hunter. If you are speaking with a client trying to squeeze you for every last discount, or aiding a customer in your store who has a fist full of coupons, you are not dealing with a fan. Fans are price insensitive, meaning that price is not a dominant factor in their consumer decision making process. You want more fans, because they will not nickel and dime you. As long as you continue to respect and appreciate them, they will continue to sing your praises, and this in turn, gets you more fans. It costs money to acquire a fan. You need to market to them and there is a cost to doing this. But, the key is that while there might be a cost for acquisition of a fan, there is a very minimal variable cost to keep them loyal. You might need to build out your social media presence with good graphics for example, and perhaps even purchase Twitter promotions, or boosts on Facebook. This is a fixed cost to acquire those fans. Once you have some, they bring others. Like a fan of a sporting event likely does not attend a game alone, a fan of your Facebook page, will like want to share the experience with a friends. Your existing fan with get you more fans. Social Media Marketing is all about the fans. You must acknowledge and appreciate your fan. They love you and you must love them back. Post valuable information often. Make sure that it is engaging, interesting and pertinent. Most importantly, make sure that it is focused on them. Share the content that they want. It is not about you. It is about them and purely marketing messages of "buy-buy-buy," will quickly dampen the enthusiastic support that you might have from your fans. Post visuals on social media that document your appreciation of your fans. As you post more and more pleasant looking photos the market will react with comments, and further tell you what they like. Monitor this with vigilance and listen to what they are saying. Your fans will appreciate being appreciated. Show some public appreciate for a customer or client right now. Publicly thank them. You do not need a strategic plan, or a marketing vision to accomplish this. You simply need a sincere and authentic desire to thank somebody for their fan support. Thank your fans. Social Media Marketing is All About The Fans. Do you understand the power of fans, but just need help? Building Aspirations can help put this success plan into action for you. Connect with us today. We are experts with social media marketing. You know your business. Building Aspirations knows social media.